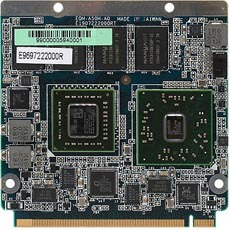 Avalue EQM-A50M, supports onboard 2G DDR3 system memory with up to 4GB DDR3 800/1066 SDRAM capacity. EQM-A50M supports dual-channel 18/24-bit LVDS and HDMI+LVDS display configurations to baseboard. For I/O, includes 2 SATA ports to baseboard, 8 USB 2.0 ports to baseboard, one Realtek 8111E Gigabit LANs and four PCIex1.